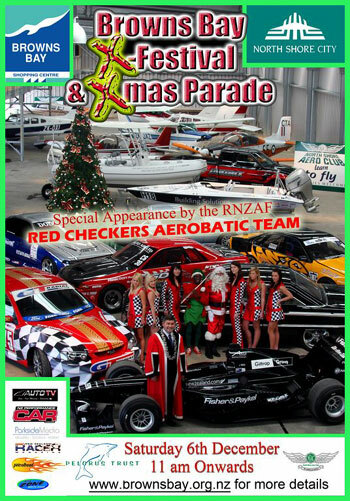 Browns Bay Christmas Parade hits the fast lane with SimDeck Formula Simulators. Tis the season for merriment, summer sun and the high speed world of Formula racing in the SimDeck Simulator on the 6 December in the delightful Browns Bay Beach. The day will feature a wide range of activities including the traditional Kiwi Xmas parade followed by a range of activities, festivities and exhibits, making it a perfectly family day. Led by Andrew Williams the Mayor of North Shore City, the parade starts in Glen Road turns right into Bute Road and then right into Clyde Road where a parade commentary is given. The parade leaves Clyde Road by turning right into Anzac Street where it then turns right into Glen Road and ends. The Browns Bay Xmas Parade and Festival is destined to be the most entertaining and high powered family event celebrating the arrival of Christmas. The beautiful bay is one of the most popular family beaches in Auckland and across the the road from the retail area. Make sure you visit for some or all of the day....and take the Simdeck Simulator for a spin down the circuit. The Simdeck Formula Sim Race Car will be part of the parade and immediately following the parade will be available for visitors to race in the race car simulator for the remainder of the day. This event will be viewed from the Esplanade Reserve and will include a live commentary. Navy Sea Sprite Helicopter from number 6 squadron RNZAF. Aircraft from North Shore Aero Club. Browns Bay Coastguard Life Saving Demonstration. Canoes & Kayaks, Model Boats Display, Power boat display, Gyro Ride, Hole in One Competition, Flight Experience, North Shore Aero Club, Mission Impossible inflatable course, SimDeck Formula 1 Race Car Simulator, V8 Super car Challenge, Hot Rod and Motor Sport Display including A1 Grand Prix Race Car, NZ V8 Championship Race Cars, Ology Water Sports Display, Food stall and more. Global Fitness Martial Arts Demonstration. The 2008 XFest! is proudly presented by the Browns Bay Business Association.